A land-based college that was rated ‘inadequate’ by Ofsted for the second time in a row last year has reiterated its “determination” to secure its long-term future, ahead of an incoming FE Commissioner report. 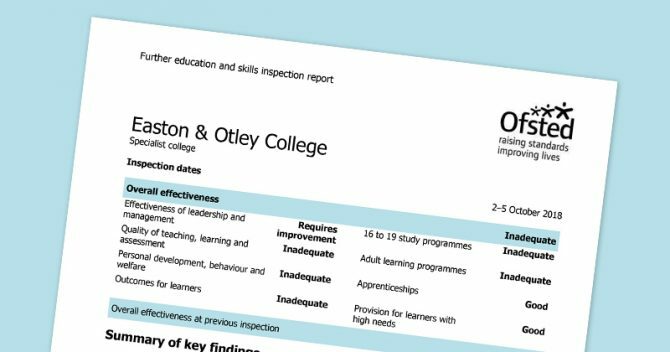 Easton and Otley College, which has nearly 550 staff and around 5,000 students, was handed a financial health notice and breach of minimum standards warning by the ESFA last June and was told to stop recruiting learners in some areas. It was also told to not enter into any new subcontracting arrangements until its performance had improved. The college, based in the east of England, was then rated ‘inadequate’ for the second time since 2017 in November. The FE Commissioner’s report, which is set to be published in the next 24 hours, will state that a full structural review is to take place at the college over the coming months. Jane Townsend, Easton and Otley College principal, said: “We are wholly committed to achieving a positive outcome. “The support from our students, parents and staff, together with the wider business community, has been nothing short of exceptional, and we are all working together to secure the college’s long-term future for the benefit of current and future students. Over the last 12 months the college has recruited a new principal and senior leadership team, as well as making “significant” changes to its board. It has also reduced staff costs by £3 million. The proportion of leavers below the minimum standard threshold for Easton and Otley’s adult education was 49.2 per cent last year. In June the ESFA said the college should “suspend the recruitment of learners” from a small subset of their adult provision. Easton and Otley was told to also “withdraw from all 19+ education and training subcontracting arrangements that have reported provision below the ESFA minimum standard” and to not enter into any new subcontracting partnerships. The suspensions are still in place. The college’s chair, Mark Pendlington, said: “We are putting every effort into making Easton and Otley a regional and national champion for teaching, and for inspiring those who will serve the employers and fast-developing new technologies on which the future of the food, drink and agriculture sector depends.